In developing countries, where phone ownership and signal coverage is continuing to expand rapidly, SMS messages are an excellent means of communicating advice and expertise to those in rural areas. We have seen texts used by healthcare providers such as AlemHealth and Totohealth, and now iShamba is a for-profit social enterprise which provides agricultural advice to farmers across Kenya via SMS. Users can subscribe to the service for 80 Kenyan shillings per month — approximately USD 0.85. In return they receive local weekly weather forecasts, market prices for two crops at two nearby markets and two agronomy tips related to their region. 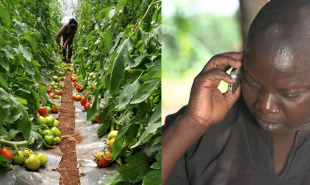 They also receive unlimited access via phone or SMS to iShamba’s Nairobi based call centre, which is manned by agronomy experts. Subscribers can text or call with specific questions and receive location relevant advice about their specific crops and livestock almost immediately. They can choose to receive SMS replies or spoken advice in English, Swahili or one of four regional languages. iShamba is run by Mediae, who also provide advice via TV show Shamba Shape Up and a national radio show, but since agricultural problems are often specific to each region, the SMS service enables farmers access to the most relevant and helpful information. There are similar ‘mAgri’ information services operating elsewhere in the developing world such as the New Dehli-based LifeLines — an answering service which enables local farmer to leave a message containing a query and receive an answer from non-profit OneWorld South Asia, also by voice message. Is there other useful information which could be shared in this way?